RIEGL’s new distribution partners for Middle East and North Africa after signing the contract in Vienna: Khaled El Nabbout from Mena 3D GmbH (second from left) und Amer Alroichdi from Mapping Solutions (fourth from left) with Johannes Riegl Jr., Michael Mayer, and Jürgen Nussbaum (all from RIEGL LMS). RIEGL is happy to announce the expansion of its global sales network with two new distribution partners responsible for the Middle East and North Africa. These new partners, Mena 3D and Mapping Solutions, both with local offices in Dubai, UAE, and headquarters in Europe, join the ever expanding RIEGL distribution network. “To meet the growing demand of our products in North Africa and the Middle East, we’ve decided to partner with local experts. We are now very proud to have two recognized experts with their companies representing RIEGL in this area. 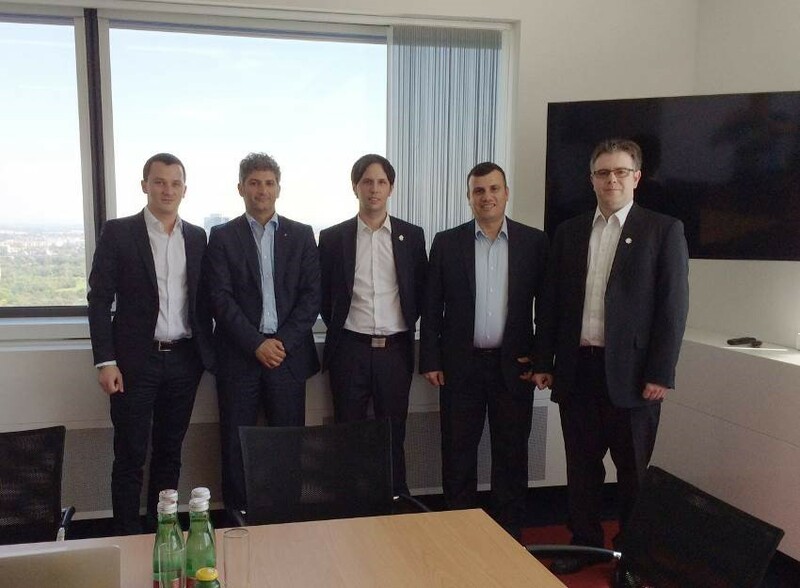 Dr. Khaled El Nabbout and his company, Mena 3D, as well as Dr. Amer Alroichdi with Mapping Solutions” said Johannes Riegl Jr., RIEGL Chief Marketing Officer, after the signing of the distribution contracts in Vienna earlier this month. Operating out of their main offices in Dubai, the new distribution partners will both be in charge of the GCC countries of Saudi Arabia, Oman, the United Arab Emirates, Qatar, Kuwait, and Bahrain. Mapping Solutions (www.mapping-solutions.co.uk) additionally will be responsible for the markets in Egypt, Yemen, Iraq, Jordan, and Syria. Mena 3D (www.mena3d.com) will additionally represent RIEGL in Lebanon, Libya, Morocco, and Tunisia. With strong support from RIEGL LMS, the two new partners will promote the innovative hard-and software solutions that RIEGL is providing for terrestrial, airborne, mobile, and UAS based laser scanning. RIEGL is very excited about the partnership with Mena 3D and Mapping Solutions and is looking forward to the expanded presence in the Middle East and North Africa!